The Application of valves is suitable and recommended for bathrooms, kitchens, storerooms, photographic laboratories, archives, press halls, photocopying centers, shops and so on. The offer is great operating efficiency and such a pleasant aesthetic appearance to even go unnoticed most of the times. Exhaust air valves can be mounted to the walls, ceiling or directly on ducts, with a great capability to suit any kind of requirement. Adjustments of air delivery are handled in a very simple way by turning central valve form the maximum opening position of the fully closed one. That distinctive feature makes system calibration remarkable easier. Exhaust air valves are the very easy mounting procedure. Standard color is white, washable, weather resistance. Made of aluminum with shaft and nut in galvanized steel. The valve is flat covers the exhaust air valves entry. Mounting is made easier by the use of appearing screws fitted on the proper counter frame. The internal contours of the annular slot formed by the outer come and the central disc give a circular uniform exhaust in the pattern. By simple adjustment of the central disc, the cray flow maintains an excellent performance even for variable air volume application. A mounting ring made of the galvanized sheet is supplied for quick and easy concealed installation from below the ceiling line. 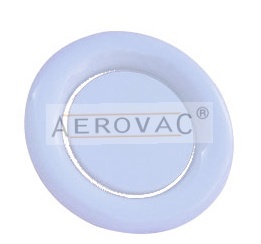 The outer body is fitted with a foam gasket to form an airtight seal with the mounting ring. Always available RAL colors to match with the false ceiling grid or tile. The Mounting ring is made of galvanized steel sheet. The outer body and central disc of the valve are made of heavy gauge aluminum in powder coated color finish.